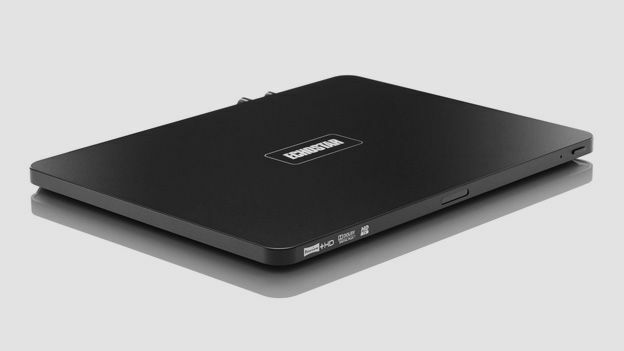 As an example of industrial design Echostar's ultra-slim Freeview DTR box is a real showstopper. The rigid aluminium chassis is fanless and has no ventilation slots, which means that it's virtually silent in use. The lightweight remote controller is less impressive; it uses two CR2032 batteries, rather than AAAs, and proves rather clicky in use. Despite its lack of girth, capacity is not an issue. A 500GB hard drive provides enough space for over 300 hours of SD. Although streaming internet TV services are part of the proposition, these are still in development. There's an apps option in the menu, but it's currently unpopulated. We're told a BBC iPlayer firmware update is planned for the second week of July, with subscription VoD from BoxOffice365 following several weeks later. However, the HDT-610R does not support the IPTV services (Connect and Vision) lurking at the back of the Freeview EPG. Although only 14mm tall, the HDT-610R still finds room for an HDMI output, aerial loopthough, optical digital audio output (via adaptor, supplied), two USBs, Ethernet and an IR blaster. The latter, an optional extra, is a nice touch as it allows the HDT-610R to be squirreled away. The USB ports are currently for software updates only, but DLNA media playback functionality is planned for later this year. Picture quality is excellent. Timeshifted hi-def channels appear crisp and textured, while Freeview's SD offerings benefit from well-judged upscaling. All the usual Freeview+ niceties are here, including series linking and HD option prompts. Two channels can be recorded simultaneously, and the deck supports chasing playback. If you're looking for a Freeview HD that's a world apart from traditional PVRs, at least in design terms, this Echostar delivers – it's both ingenious and beautiful. Echostar's thin-omenon is also an extremely impressive performer. Recorded images appear bit-for-bit-identical to original broadcasts and there are no unwanted artefacts associated with the upscaling of standard definition channels. It's also blessed with an extremely responsive user interface. At the time of review, online net functionality has yet to be activated, although both BBC iPlayer and subscription Video on demand service Box Office 365 are expected to go live by the end of July.